Time for more "Things I Am Loving This Week", those mostly food-related things that I am enjoying and want to share. I love "repurposing" leftovers into something new and equally as good. I had purchased an extra wild salmon fillet when I went to shop for my Salmon Carpaccio with Hearts of Palm Salad and Coconut Dressing for Tyler Florence Fridays. Rather than pounding it out for more carpaccio, I poached the fillet and and made some Asian-inspired Sesame Salmon Burgers. By adding Tyler's coconut dressing to some non-fat Greek yogurt, I had a flavorful sauce that worked really well with the burgers. On a whole wheat bun, and garnished with lettuce, thin strips of carrot and sprouts from my CSA box, it made a hearty, healthy and delicious lunch. Flake the salmon with a fork. Mix gently but thoroughly with other ingredients. Make sure mixture is moist but not wet. Form into two large patties to fit hamburger buns. Heat a pan over medium-high heat, spray with olive oil cooking spray and add patties, searing on each side about 3 minutes, or until lightly browned on both sides and warmed through. Place lettuce on a whole wheat bun, add the salmon and your favorite garnishes and condiments. You can get the recipe for Tyler's Coconut Dressing here. I added about 2 Tbsp of the dressing to 1/2 cup of non-fat Greek yogurt. You could also use your favorite Asian salad dressing or pesto, mixed with yogurt for a similar effect. When I want something salty and good my snack of choice is Salt & Pepper Potato Pop Chips. Yes, there are other flavors like Original, Barbecue, Sour Cream & Onion, etc. (I have tried most of them), and they are all good, but it is the classic salt & pepper version that makes my heart beat giant love. They seem to have the perfect amount of salt and enough pepper to give them a little kick--just perfect. If you have not tried Pop Chips you simply must as they cure that urge for a salty crunch at less than half the fat of regular potato chips and without the funky taste you find in other low-fat chips. Love them! 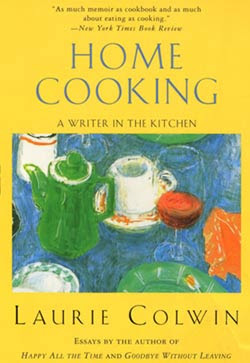 Finally, I don't know why it took me so long to discover the beautiful writing of Laurie Colwin, but I have been slowing reading and savoring her book of collected essays, "Home Cooking: A Writer in the Kitchen". If you are not familiar with Colwin, she was an American novelist who loved to cook. She was a regular contributor to Gourmet magazine for several years and she penned several books of fictional short stories and novels. Sadly, she died very suddenly and unexpectedly of heart failure in 1992, when she was just 48 years old. "Home Cooking" is a collection of her Gourmet columns published in 1988, and was followed by a second collection in 1993 called More Home Cooking: A Writer Returns to the Kitchen, that was published after her death. I had heard of Colwin but had not read any of her work until I bought both "Home Cooking" collections at a local used book store. When I took them up to pay for them, the owner said, "You will fall in love with these!" and she was right. Although the essays are short and the book could easily be finished quickly, I am finding that reading an essay or two at night before I sleep is good for the soul, and I am about two-thirds of the way through the first book. Colwin's writing is very conversational--you feel like you are listening to a friend as you read her prose and the essays are charming, with recipes and cooking tips woven in. Wonderful! So that is what I am loving this week. How about you? I have to try and find that book, it sounds wonderful and what a great "hamburger", love the coconut sauce. Your salmon burger looks amazing...I have some salmon right now and am going to check my cupboards for the rest (fingers crossed)...even the bun looks amazing! And yes, I'm going to look for that book, too...Plus I love salt & pepper chips...GREAT STUFF TO LOVE! Your salmon burger looks really good, Deb. I always try to repurpose my leftovers. Love the burger, I have never had a salmon burger - looks totally delish. Chips too! I love how you've been incorporating recipes into your things that you are loving. The coconut sauce with the sesame salmon burgers sounds amazing. Genius! Hello, this page is fabulous. Thank you for inviting me. Your food is too beautiful for words. I too am a Kamaaina, but mainland bound for now. What island are you on? Is it in your blog and I didn't see it? The salmon looks delicious. I, too, am a big fan of Colwin. Thanks for so many nice ideas !! I'm going to look for the book !! I am totally into salmon burgers right now too! I love the Asian flavor twist. The salmon burgers look fabulous, must be wonderful with the coconut sauce! You know, Deb, I was thinking about Home Cooking by Laurie Colwin as a possibility for Cook the Books. I read this book and More Home Cooking years ago and was wistfully thinking of rereading it as I was dusting my bookshelves. A lovely post. Re-purposing leftovers is great! I find it so satisfying! I wish we got those chips here, the "healthier" ones I have tried have all been awful.